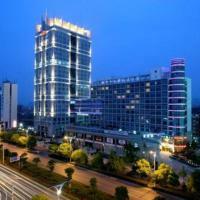 Culture Plaza Hotel Zhejiang is located in Hangzhou Technology Development Zone, 5 miles from Hangzhou Train station. It offers a fully equipped gym, two restaurants and free parking on site. Zhejiang Culture Plaza is 22 miles from Hangzhou Xiaoshan International Airport. The cozy rooms of Culture Plaza are equipped with cable TV and a minibar. Rooms are spacious and have oriental designs. Guests can enjoy foot massages or relax in the sauna rooms. The hotel also has a game room with mah-jong tables. The hotel’s restaurant serves a variety of Chinese food. The coffee shop offers Western and southeast Asian cuisine. Zhejiang International Hotel is in central Hangzhou, a short distance from China’s Grand Canal and Wulin Square. Overlooking West Lake, it features an indoor pool and a fitness center. Rooms at International Zhejiang are air-conditioned and equipped with satellite TVs. A minibar, tea/coffee making facilities and personal safe are included. Guests can enjoy a game of racquetball and tennis at the on-site courts. Relaxing massage services and a sauna are also available. Silk Road Restaurant serves authentic Chinese dishes. Western favorites can be found at Coffee Garden. Drinks are available at the internet bar and tea house. Zhejiang International Hotel is a 20-minute drive from Hangzhou Xiaoshan International Airport. Hangzhou Train Station is a 10-minute drive away. Huachen International Hotel is a stylish 4-star hotel located a 10-minute walk from the West Lake. It offers modern accommodations with 2 restaurants, free parking and free internet in rooms. Guest rooms at Huachen offer plenty of natural light and are fitted with tea/coffee making facilities and a TV with cable channels. The private bathroom comes equipped with a bathtub. On the hotel’s 19th floor, the Four Seasons Western-Style Food & Coffee House overlooks West Lake and serves an all-day buffet. Local dishes can be enjoyed at the Tang Palace Chinese Restaurant. The hotel’s tour desk can assist with car rental and travel arrangements. Hotel Huachen International is a 5-minute walk from Yanan Road. It is a 40-minute drive from Hangzhou Xiaoshan International Airport. Surrounded by hills and greenery, Westlake Hillview International Hotel enjoys beautiful views of Yuhuang and Jiuyao Mountain. The 5-star hotel features Oriental architecture, free Wi-Fi and luxurious spa services. The hotel is a 10-minute drive from Hangzhou Train Station. It is about 19 miles from Hangzhou Xiaoshan International Airport. The rooms at Hillview Westlake Hotel overlook the scenic West Lake and natural landscapes. Every room has a flat-screen TV, a DVD player and stylish glass-wall bathrooms. Guests can maintain their daily workout at the fitness center or tennis courts. After a full day, relaxing massage services can be enjoyed at the spa. Westlake Hillview serves both Chinese and Western dishes in its restaurants. Drinks are available at the hotel’s bar. Sofitel Hangzhou Westlake is located near the Central Business District and Xihutiandi. It offers 5-star accommodation with free internet access. 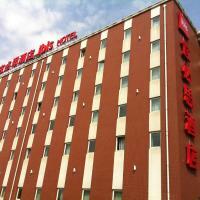 The hotel is 3 km from China Silk Museum and 4.5 km from Zhejiang Provincial Museum. Hangzhou Railway Station is less than 2 km away. Rooms at Hangzhou Sofitel Westlake feature elegant furnishings and floor-to-ceiling windows. All are equipped with a flat-screen TV and tea/coffee making facilities. Luxurious marble bathrooms are equipped with rainshowers. The hotel offers meeting facilities, business centre and currency exchange. Added conveniences include room service, luggage storage and safety deposit box. Art 6 Western Restaurant offers Western dishes, as well as breakfast. Yong Jin Ge Chinese Restaurant overlooks West Lake and serves fine local and Cantonese cuisine. The 5-star Grand Metropark Hotel Hangzhou is a 5-minute walk from the scenic West Lake. The luxurious hotel offers 4 dining options, an outdoor pool and free internet access. The spacious rooms at Hangzhou Grand Metropark feature beautiful views of the city, mountain or lake. Each has a minibar, satellite TV and desk. Private bathrooms come with a bathtub. Guests can pamper themselves at the beauty salon or enjoy a game of mah-jong at the game room. Metropark Grand also offers free parking, a tennis court and fitness center. Peony Chinese Restaurant serves authentic Chinese dishes and Dim Sum. Other dining options include Japanese and Western food. Refreshing drinks are available at Cinnabar Lounge. 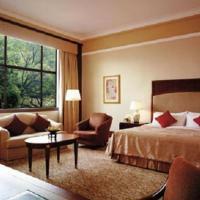 Grand Metropark Hotel Hangzhou is less than 3 miles from Hangzhou Train station. Hangzhou Xiaoshan International Airport is 16 miles away. 5-star Landison Plaza Hotel Hangzhou is a short walk from West Lake and 650 ft from Hangzhou Theater. It offers free internet in the entire hotel, an indoor pool and 7 dining options. The elegant rooms at Plaza Landison Hangzhou offer spacious interiors and are equipped with a cable/satellite TV and tea/coffee making facilities. A minibar and private bathroom is provided. Guests can work out at the fitness center or relax in the sauna. Other facilities include a business center, laundry services and car rentals. Dining options range from delicious Italian to authentic South East Asian dishes. The hotel also features 2 bars. Landison Plaza Hotel Hangzhou is about 2 miles from Hangzhou Train station. Various tourist attractions like Hangzhou Tower Shopping Center and The Zhejiang Province Peoples Great Hall are a short walk away. Regarded as a landmark at Hangzhou’s east entrance, this hotel is a mile from Wulin central business district and 2.5 miles from West Lake, the freeways and local shopping. The elegantly furnished rooms, with stylish and modern facilities, are designed to offer unconventional enjoyment and give you a sweet feeling of home. There are 9 conference rooms of different sizes to meet different requirements. Oriental Pavilion Ballroom is one of the largest ballrooms in Hangzhou for gatherings of up to 750 people. 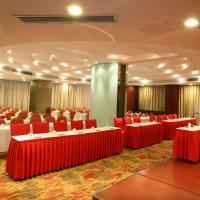 The meeting package offers advanced equipment, professional banquet service and an ideal venue for all types of events. For relaxation, enjoy games of ping-pong and chess, or head to the card rooms and nightclub. The health and spa center features a gym with state-of-the-art exercise equipment, massage and other therapies. Ramada Plaza Hangzhou is situated in the commercial district, a 45-minute drive from Hangzhou Xiaoshan International Airport. It offers an indoor pool, gym and 3 dining options. Parking is free. The cozy rooms at Plaza Ramada are brightly lit, featuring views of the city or West Lake. Each room is equipped with a TV, DVD player and work desk. The private bathrooms come with bathtub and shower facilities. Other amenities include a minibar and refrigerator. Guests can exercise at the fitness center, laze in the sauna, or enjoy a relaxing foot massage. The hotel provides car and bike rental services. Travel and sightseeing arrangements can be made at the tour desk. Le Paris serves international buffet while Hemingway Steakhouse offers luxurious Western dining. For alternative dining choices, the Haihua Ge Chinese Restaurant serves traditional Cantonese and Sichuan cuisine. Ramada Plaza Hangzhou is a 15-minute drive from National Silk Museum and 4 miles from Lingyin Temple. 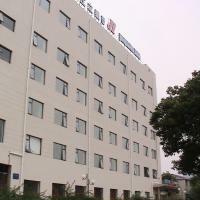 In Shangcheng business district, the Friendship Hotel Hangzhou provides air conditioned rooms with free wired internet. The hotel offers a fitness center, 5 dining options and bike rental. Rooms have satellite TV, a minibar and a tea/coffee maker, some featuring views of the scenic West Lake. Private bathrooms come with a shower, bathtub and amenities. 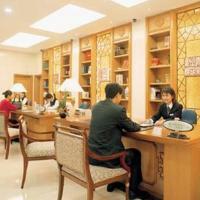 The Hangzhou Friendship Hotel provides ticketing services, and it offers assistance with car rentals. There is a souvenir shop, as well as a tour desk. Airport transportation can be arranged. The Restaurant Café and Bar serves an international buffet, while 2 restaurants offer regional Chinese cuisine. Hang Bangcai specializes in seafood dishes, and the lobby bar offers light snacks and cocktails. The Friendship Hotel Hangzhou is a 15-minute drive from West Lake Culture Square. It is 2 miles from Hangzhou Train Station and 22 miles from Hangzhou Xiaoshan International Airport. Best Western Richful Green Hotel is less than 550 yards from the Teisha River. It offers spacious and stylish air-conditioned rooms with free internet, satellite TV and luxurious bathrobes. Every night various Cantonese, Italian and Western dishes are served in the restaurant. In the hotel bar, light snacks and refreshing drinks are available. 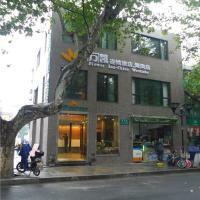 For convenience, the Best Western Premier Hangzhou has a business center with fax and photocopying services. It also provides a 24-hour front desk, and car rental facilities. 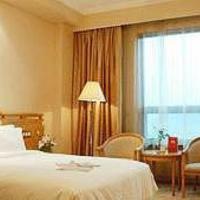 Best Western Premier Hangzhou Richful Green is half a mile from Hangzhou Train Station. It is only a 25 minute drive from Hangzhou Xiaoshan International Airport. Directly across from Yellow Dragon Scenic Spot along the West Lake, Tea Boutique Hotel is a 5-minute walk from Huanglong Stadium. The hotel features free internet access and Thai-style spa treatments. All guests can enjoy free famous local green tea in the guest rooms. Tea Boutique Hotel is half a mile from Hangzhou World Trade Center and a 5-minute drive from Wulin Square. Hangzhou Train Station is 2.5 miles away. Rooms at Boutique Tea Hotel have traditional Chinese décor. Each unit comes equipped with free Wi-Fi, stylish private bathrooms and a satellite TV. Room service is available. The hotel’s spa features relaxing massage and beauty treatments. Guests can also take a walk at the nearby Botanical Gardens or Gushan Park. Local and Cantonese dishes are served at the hotel’s restaurant. The popular Tai Lake’s Steamed Crab can also be enjoyed. Drinks are available at the bar. Landison Longjing Resort is ideally nestled in the historic Longjing Tea Plantation. It is one mile from the West Lake and offers an outdoor swimming pool. Spacious rooms of Hangzhou Landison Longjing Resort are well equipped with flat-screen TVs, free internet and green tea bath amenities. They enjoy stylish furnishings with dark-wood floors and warm colors. Cha Restaurant serves Chinese cuisine, Southeast Asian specialties and Western favorites. The Aqua bar overlooks the pool and scenic surroundings, while T Lounge serves a unique tea menu and cocktail list. Resort Landison has a gym, sauna and Jacuzzi for relaxation. A range of treatments and massages can be experienced at the T Spa. 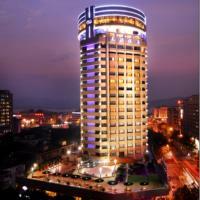 Jinjiang Inn-Hangzhou Wulinmen is located along the Tiyuchang Road, a 20-minute walk from Baoshu Tower and Duan Bridge. The modern hotel provides free parking and rooms with free internet. Jinjiang Inn Wulinmen is a 20-minute drive from Hangzhou Train Station. Rooms at the Hangzhou Jinjiang Inn are air-conditioned and have 24-hour hot water showers. Each comes with a tea/coffee maker and a flat-screen cable TV. Daily newspapers and safes are provided at the 24-hour front desk. For added convenience, a business center and laundry services are available. A daily breakfast buffet is available at the hotel’s restaurant. Located in the Xiacheng District, JJ Inns Hangzhou West Lake Cultural Square Hotel offers rooms with free internet and cable TV. It has a restaurant and free parking. All guestrooms feature a private bathroom with 24-hour hot shower and air conditioning. A tea/coffee maker and slippers are provided. Business facilities, luggage storage and safety deposit box are available at the hotel. A buffet breakfast is served at the hotel’s restaurant. JJ Inns Hangzhou West Lake Cultural Square Hotel is a 10-minute walk to the West Lake Culture Square. It is 20 km away from Xiaoshan International Airport. JJ Inns Hangzhou Genshan Road Hotel is a 2-minute walk from the Yun River. It offers rooms with free internet and cable TV, a cafe and free parking. Rooms have air-conditioning and a private bathroom with 24-hour hot shower. A tea/coffee maker and slippers are provided. Business facilities, baggage storage and a safe are available. Meals are served at the Xinglianxin Cafe. JJ Inns Hangzhou Genshan Road Hotel is a 40-minute drive from the Hangzhou Xiaoshan International Airport. The Jinjiang Inn - Hangzhou Economic-Technological Development Area Hotel features rooms with free internet and cable TV. Business facilities, a cafe and free parking are available. The rooms are air-conditioned and have a private bathroom with 24-hour shower. Each room features a coffee/tea maker and slippers. 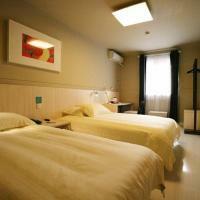 The hotel provides a safe, luggage storage and laundry services. Meals are served at the Xinglianxin Cafe. The Jinjiang Inn Hangzhou Economic-Technological Development Area Hotel is a 30-minute drive from the Hangzhou Xiaoshan International Airport. As the winner of the International Star Diamond Award by AAHS, the environmentally-friendly Dragon Hotel is located in Hangzhou, a 45-minute drive from Hangzhou International Airport. The hotel offers free Wi-Fi and flat-screen satellite TVs. A wellness centre and 6 restaurants are available. The modern rooms at Hotel Dragon are equipped with personal HTC smart phones and interactive TV systems. Each comes with an iPod dock and DVD players. Free bottled water is provided. The hotel’s spa offers a fully-equipped fitness centre and an indoor heated swimming pool. Dragon Hotel also offers an art gallery and a helpful airline reservations service. 24-hour room service is provided. D' Café features open kitchens serving Chinese, Japanese and Italian cuisines. The Veranda offers Italian dishes and views of Baoshi Mountain. Drinks are available at The Laurel Lounge. Dragon Hotel is a 20-minute drive from Hangzhou Train Station. Oakwood Residence Hangzhou is located in the Yellow Dragon commercial district along Jiaogong Road. The hotel features free Wi-Fi in public areas, an indoor pool and flat-screen TVs in rooms. Each air-conditioned apartment comes with separate kitchen and dining areas. A DVD player, washing machine and dryer is provided. Oakwood Residence Hangzhou features a 24-hour room service, a business center and fitness center. Guests can dine at the hotel’s Oakleaf Restaurant and Bar. Oakwood Residence Hangzhou is a 45 minute drive from Hangzhou Xiaoshan International Airport. 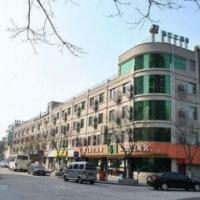 SSAW Plaza Hotel is in the Wulin Commercial Area, a 10-minute walk from Wulin Square. Featuring rooms with free internet access and flat-screen satellite TVs, it has a fitness center and free parking. Each air-conditioned room at the SSAW Plaza Hotel has a private bathroom, minibar and tea/coffee maker. Bathrobes, slippers and free bottled water are provided. Guests can relax with a massage and enjoy the services of a beauty salon. Ticket services and foreign currency exchange are available. SSAW Plaza Hotel is a 4-minute walk from Wulin Square subway station (Line 1) and a 5-minute drive from the West Lake. Hangzhou International Airport is a 45-minute drive away. 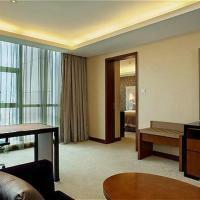 New Century Grand Hotel Hangzhou is situated along Xinshin Road and offers rooms with free internet. It features an indoor swimming pool, a fitness centre and 10 dining options. Rooms at the New Century Grand Hangzhou come with a flat-screen satellite TV minibar and safe. A tea/coffee maker, bathrobes and slippers are provided. Guests can enjoy massage services or relax at the hotel’s spa. Laundry and dry cleaning services are available at the hotel. Hangzhou and Cantonese cuisines are served at Four Seasons Chamber Restaurant, which specialises in abalone, shark’s fin and bird’s nest. The Montalcino Grill offers Western meals and Yimariga Restaurant features Japanese food. New Century Grand Hotel Hangzhou is a 25-minute drive from Hangzhou Train Station. Located at Xinguang Avenue, the biggest Commercial Street in Hangzhou, Binjiang Seven Service Apartment is 11 miles from Hangzhou South Train Station. It features rooms with flat-screen TVs and free internet. Binjiang Seven Service Apartment is 17 miles from Hangzhou International Airport. Each room has a well-equipped kitchenette and private bathrooms. The kitchenette is equipped with washing machine, dryer and stove. 24-hour room service is available. Guests can make ticket reservations at the tour desk. SSAW Yilian Hotel is in Huanglong Business district, a 15-minute walk from West Lake. The stylish hotel offers affordable accommodations with a restaurant, free parking and rooms with free internet. Hangzhou Train Station is 4 miles from SSAW Yilian Hotel. It is 22 miles from Hangzhou Xiaoshan International Airport. Cozy rooms of SSAW Yilan feature trendy modern furnishings. Each room has an electric teakettle, a work desk and a flat-screen TV with satellite channels. All rooms have a private bathroom with hot shower. Baggage storage is available at the 24-hour front desk. The hotel also provides currency exchange services and has a business center. The hotel’s restaurant serves a selection of Western dishes. Light meals and beverages are offered. Just half a mile from the scenic West Lake, St. Rich Hotel offers modern accommodations in the West Lake District. Relaxing foot massage, free internet and free parking are available. 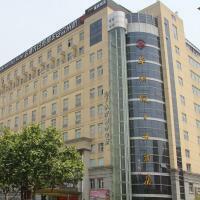 Hotel St. Rich is one mile from Hangzhou Train Station. Xiaoshan International Airport is about 22 miles from the hotel. Fully air conditioned, rooms at St. Rich feature stylish décor and glass-wall bathrooms. Each comes with a flat-screen satellite TV and tea/coffee making facilities. A personal safe and hairdryer are also included. Guests may make use of the hotel’s ticketing and baggage storage services at the 24-hour front desk. The hotel also provides laundry and dry cleaning services. St. Rich Hotel’s restaurant serves authentic Chinese dishes. A breakfast menu and private dining rooms are also available. The spectacular 5-star Zhejiang Hotel enjoys a prime location within the West Lake scenery area. It boasts an indoor landscaped pool, tennis courts and a spa. All rooms are well-furnished. Spreading over 50 acres of beautiful grounds, the hotel is surrounded by lakes and mountains. All rooms are spacious with a sitting area and a bathroom featuring a bathtub, toiletries and a hairdryer. Select rooms have private balconies. Guests can enjoy luxurious massages and spa treatments or make use of the sauna facilities. For a complete pampering session, visit The Zhejiang’s barber and beauty salon. There is also a well-equipped fitness center. Both Chinese and Western cuisine are served at Hotel Zhejiang’s beautiful restaurant. It features large glass windows that allow much natural light in. Views of the grounds accompany meals. Zhejiang Hotel is close to various West Lake sightseeing sites with a short walk. It is 3 miles from the downtown area, and 22 miles from Hangzhou Xiaoshan International Airport. With Leifeng Pagoda as a backdrop, Xizi Hotel offers elegant rooms situated by the scenic West Lake. Offering free parking, it features 4 restaurants, an indoor pool and fitness facilities. Just 2 miles from the center of the city, Zhejiang Xizi Hotel is 3 miles from Hangzhou Train station. It is 23 miles from Hangzhou Xiaoshan International Airport. Decorated in calming neutral shades, air conditioned rooms at Hotel Xizi feature views of surrounding greenery from over-sized windows. Offering spacious layouts, they come with a flat-screen TV and safe. Relax with a friendly game at the tennis courts or bowling alley. Other recreation options include billiards and ping-pong facilities, as well as karaoke cabins. Yiyuan Coffee Shop features a show kitchen, and offers stunning views of landscaped grounds. Decorated with Chinese silk paintings, fine Chinese dining can be enjoyed at Peony restaurant. 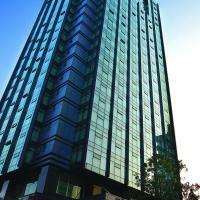 Hangzhou Tower Hotel offers modern accommodation in Hangzhou, 2 km away from the famous West Lake. It offers 4 restaurants, a business centre, and a sauna. Foot massages are available. Hangzhou Tower Hotel is 5 km away from Hubin Park and Hangzhou Stele Forest, and 6 km from the railway station. Xiaoshan International Airport is 30 km away. Rooms at Hangzhou Tower come with flat-screen TVs and free internet access. Each room also features a sitting area, a safety deposit box and a work desk. Some rooms include a private hot tub. The hotel offers laundry and dry cleaning, as well as concierge service and car rental. It has a beauty salon and a 24-hour front desk. San Yuan Restaurant serves buffets for breakfast, lunch, dinner, and supper. Other dining outlets include local, Taiwanese, and Japanese options. Light snacks and desserts are also available. Courtyard Hangzhou Wulin is in the heart of Hangzhou, a 10 minute drive from the famous West Lake. Featuring views of The Grand Canal, it offers an indoor pool, free parking and free Wi-Fi access. Air-conditioned guest rooms feature spacious interiors with modern furnishings. Each room comes with a minibar, ample work space and a flat-screen TV with satellite channels. Hangzhou Wulin Courtyard has a well-equipped fitness center on site. The tour desk can assist guests with making travel arrangements. Laundry and dry cleaning services are available. For meals, MoMo’s style is contemporary with enticing dishes that reflect the diversity of the modern world. Guests can enjoy drinks and light refreshments at the MoMo 2 Go, which also offers souvenirs. The hotel is 3 miles from Hangzhou Train Station and 19 miles from Hangzhou Xiaoshan International Airport. Located in Xiaoshan Central Business District, Holiday Inn is a 20-minute drive from Hangzhou Xiaoshan International Airport. The hotel features an indoor pool and well-equipped gym. Rooms offer free internet. Guestrooms at Holiday Inn Xiaoshan feature a modern interior with plenty of natural light. Each is equipped with a flat-screen TV with cable channels. Tea and coffee making facilities and a minibar are provided. The hotel offers a sauna and spa centre. Guests can find luggage storage and safety deposit boxes at the 24-hour front desk. Currency exchange and car rental services are available. Western and Chinese dishes can be enjoyed in the hotel’s restaurant. Drinks are served at the lobby bar. The hotel is 5 km from Xiaoshan Railway Station and 13 km from Hangzhou Railway Station. The luxurious Zhejiang Hotel is located in downtown Hangzhou, just a 5-minute walk from Wulin Square and a 10-minute walk from West Lake. Fengqi Road subway station (line 1 and 2) is just 20 metres away. 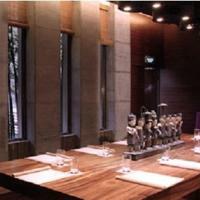 The 5-star hotel features the famous Tian Xiang Lou Restaurant and offers free parking on site. Air-conditioned guestrooms feature modern interiors and furnishings. Each room is well-equipped with a minibar, tea/coffee making facilities and a large flat-screen TV with cable channels. Zhejiang Hotel is 4 km from Hangzhou Railway Station and 30 km from Hangzhou Xianshan International Airport. Tian Xiang Lou serves a variety of local cuisine. Both Western and Chinese dishes can be found Celebrity 24H Restaurant. Drinks can be enjoyed at the lobby bar. Guests can enjoy a foot massage or make use of the sauna facilities at Hotel Zhejiang. Free Wi-Fi is provided at this hotel. Regal Plaza Hotel is in the middle of Hangzhou, 650 ft from Wulin Square. The luxurious 5-star hotel offers stylish accommodations with 2 restaurants, free parking and free in-room internet. Air-conditioned guest rooms feature spacious interiors with modern furnishings. Each room is equipped with a minibar, tea/coffee making facilities and a TV with cable channels. Jade Palace Chinese Restaurant serves a variety of Cantonese and Hangzhou dishes. An international buffet, including western and Asian delights, can be enjoyed at the Cafe Galerie Restaurant. Laundry and dry cleaning services are offered at Regal Plaza Hotel, Hangzhou. The tour desk can assist guests with making travel arrangements. Baggage storage can be found at the 24-hour front desk. Plaza Regal Hangzhou is one mile from West Lake and 20 miles from Hangzhou Xiaoshan International Airport. It is 3 miles from Hangzhou Train station and Hubin Park. Zhong An Hua Na Hotel a 4-star property located a short 10-minute drive from Wulin Square. It offers modern accommodation with an indoor pool, a spa and free internet in rooms. Air-conditioned guestrooms are equipped with tea/coffee making facilities, a computer and a flat-screen TV with cable channels. The en suite bathroom comes with toiletries and a hairdryer. Guests can work out at the well-equipped fitness centre or unwind in the sauna rooms. Other recreational facilities include a games room and karaoke rooms. The tour desk can assist with making travel arrangements. The restaurant serves a wide selection of Western and Chinese dishes. Light snacks and refreshing beverages can be enjoyed at the lobby bar. Hangzhou Railway Station is 8 km from Zhong An Hua Na. Hangzhou Xiaoshan Airport is 20 km away. SSAW Boutique Hotel is in central Xiaoshan, a 10-minute drive from Xiaoshan Train Station. It features a rooftop restaurant, well-furnished fitness center and spacious rooms with free internet. Modern décor and hardwood floors are featured throughout the guest rooms at Boutique SSAW. Each room has plenty of natural light, and is equipped with a flat-screen TV with cable channels. A hot shower and toiletries are provided. Guests can relax in the sauna or rent a car to explore the city. The hotel provides currency exchange and concierge services. Laundry and dry cleaning services are available upon request. In a glass house, the restaurant serves a variety of local and international dishes. Light snacks and refreshing beverages are also available. 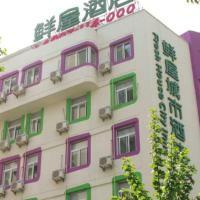 SSAW Hotel has free parking, and is 11 miles from Hangzhou Xiaoshan International Airport. Hangzhou Train Station is 16 miles from the hotel. Offering spacious air conditioned rooms with kitchenettes, Fortune Plaza Service Apartment is centrally located a 5 minute drive from Wulin Square. It features free wired internet, fitness facilities and a business center. Located in Hangzhou's central business district, Fortune Plaza Service Apartment is 2 miles from Hangzhou Train Station and 12 miles from Hangzhou Xiaoshan International Airport. Free parking is available. Featuring modern interiors and cable TV, rooms offer plenty of natural light from over-sized windows. They have ample workspace, a safe and hairdryer. The staff at the 24-hour front desk can offer concierge service and attend to laundry needs. Other amenities include in-house shops and a restaurant with Western and Chinese menus. Standing on the beautiful shore of Hangzhou's West Lake, the luxurious Shangri-La Hotel offers 5 dining options, an indoor pool and outdoor tennis courts. Free in-room internet is available. Air-conditioned rooms equipped with carpeted floors enjoy beautiful views of West Lake, the mountains or grounds. A flat-screen TV, minibar and personal safes adds to the comfort of each room. Shangri-La Hotel, Hangzhou is a 10-minute walk from Su Causeway. It is 4 miles from Hangzhou Train Station and 21 miles from Xiaoshan Airport. The modern Fitness Center has massage facilities, relaxing steam baths and a well-equipped gym. The hotel also provides a business center and free parking. Guests may sample international buffet spreads at Coffee Garden, gourmet Italian dishes at Peppino and authentic Chinese cuisine at Shang Palace. Drinks can be enjoyed at the Lobby Lounge or Garden Bar. Flower Inn - West Lake Branch is located in the West Lake tourist area, a 7-minute drive from Nanshanlu Bar Street. It offers modern accommodations with a restaurant, free parking and rooms with free internet. Air-conditioned guest rooms feature elegant interiors with hardwood floors. Each room is equipped with a work desk, tea/coffee making facilities and a flat-screen TV with cable channels. The tour desk can assist with making travel arrangements. Fax and photocopying facilities can be found at the business center. Baggage storage is available at the 24-hour front desk. The on-site restaurant serves a selection of Chinese dishes. West Lake Flower Inn is 6 miles from Wulin Qaure and Hangzhou Train Station. Hangzhou Xiaoshan Airport is 22 miles from the hotel. Blossom Hotel Hangzhou is in Xiaoshan District, just over half a mile from Central Square. It features a fitness center and foot massage services. Free internet access and free parking are provided. Blossom Hotel is within 12 miles of Hangzhou Train Station and Hangzhou Xiaoshan Airport. Wulin Square is 17 miles away. Rooms feature modern touches of traditional Chinese culture. Each is equipped with a flat-screen TV with cable channels. Each room provides access to the hotel’s executive lounge. Guests can enjoy a karaoke or chess session using the hotel’s facilities. Bikes are available for free for guests who would like to explore the area. The hotel’s tour desk provides ticket services. A variety of Chinese cuisine is served in the restaurant. Room service is also available. Holiday Inn Hangzhou City Center is located 2.5 km from Wulin Square. The hotel features an indoor pool, fitness centre and spa. Its spacious and modern rooms are fitted with a flat-screen cable TV. Holiday Inn Hangzhou City Centre is 3 km from Hangzhou Railway Station. Hangzhou Xiaoshan International Airport is 25 km away. Guestrooms each have a minibar and tea/coffee-making facilities. An iron and safety deposit box is provided. Bathrooms come with a bathtub and shower. Guests can relax in the sauna or head for a sightseeing trip organised by the tour desk. Ticketing and currency exchange services are available. Laundry and dry cleaning can also be done in the hotel. There are 4 dining options within the hotel. Oak Grill serves steaks and seafood prepared in an open kitchen while Spring Garden serves the best of Hangzhou cuisine and Chinese dishes. For a round of drink, guests may head to Lobby Lounge. Located 3.5 km from Hangzhou Railway Station, Crowne Plaza Grand Canal features an indoor pool and fitness centre. Modern and spacious rooms offer an iPod dock and flat-screen TV. Three dining options await guests. 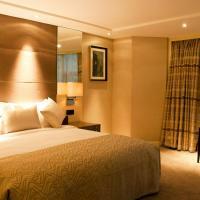 Crowne Plaza Hangzhou Grand Canal’s rooms are soundproofed and air conditioned. Each has tea/coffee making facilities and an iron. Select rooms offer free internet access. Guests can request for massage services or head to the sauna or spa bath to relax. The hotel has a business centre and tour desk. Free parking is provided. The hotel is 5 km from West Lake. Hangzhou Xiaoshan International Airport is 35 km away. Traditional Hangzhou cuisine can be enjoyed at Min Ren Min Jia restaurant while Fu Café offers a variety of international cuisine. Light snacks and refreshing drinks are served at Insomnia Bar. Sophia Hotel Hangzhou offers 4-star modern accommodations along Shangcangqiao Road, a 10-minute walk from scenic West Lake. In addition to a spa, it has free internet and a 24-hour front desk. Elegantly decorated, air conditioned rooms are equipped with a mini-fridge, flat-screen TV and personal safe. Private bathrooms feature a hairdryer and hot water showers. Sophia Hotel Hangzhou is 2 miles from Leifeng Pagoda and Changqiao Park. It is a 5-minute drive from Hangzhou Train Station and a 30-minute drive from Xiaoshan Airport. The hotel's spa features relaxing massage and foot baths. For recreation, guests can also sing karaoke, exercise at the gym or play chess. The classy Chinese restaurant has private dining rooms where guests can entertain. Breakfast is served at Royal Street Cafe. Flower Inn Hubin – Hangzhou is located in the West Lake Scenic area, 2.5 miles from Hangzhou Train Station. Featuring oriental touches, it offers modern accommodations with free parking and rooms with free internet. Air-conditioned guest rooms are equipped with a minibar, tea/coffee making facilities and a flat-screen TV with satellite channels. The private bathroom comes with toiletries and a hairdryer. The hotel has a business center with fax and photocopying services. Baggage storage is available at the 24-hour front desk. Hangzhou Hubin Flower Inn is 16 miles from South Train Station and 19 miles from Xiaoshan International Airport. In Hangzhou’s Economic and Technology Development Zone, Ibis Xiasha is 218 yards from Wumei Mall. It features free internet, a restaurant and non-smoking rooms with a cable TV. 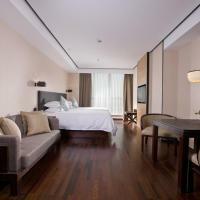 Air-conditioned rooms at Ibis Hangzhou Xiasha have modern interiors and hard hardwood floors. All rooms feature a sitting area and a private bathroom with hot shower facilities. The restaurant serves a buffet of local and international dishes. Light snacks and refreshing beverages can be enjoyed at the bar. 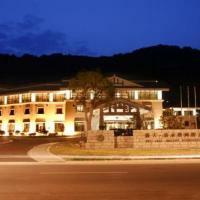 The hotel has a 24-hour front desk and provides car rental services. Ticketing and sightseeing bookings can also be made at the tour desk. Hangzhou Xiasha Ibis offers free parking, and is 2.5 miles from Qiantang River. West Lake is 11 miles from the hotel. Jinma Palace is located 1 km from Xiaoshan Technical Economic Development Area. It features an indoor pool and fitness centre. Massage services and a sauna await guests. Rooms offer free internet access. Jinma Palace is situated 15 km from Hangzhou Railway Station. Wulin Business Centre and Xiaoshan Airport are 20 km away. Rooms are decorated in soothing pastel shades of brown. Each offers cable TV channels and a minibar. An electric kettle, safe deposit box and ironing facilities are provided. The hotel has a hair and beauty salon for guests looking to pamper themselves. Table tennis and karaoke facilities are available within the hotel. Ticketing and currency exchange services are also offered. Local Chinese cuisine can be enjoyed at the hotel’s restaurant. Room service is also available. Crystal Lemon Hotel is half a mile from Hangzhou’s Qian Tang River. It offers modern and spacious rooms with free internet access and kitchen facilities. Each room also has a washing machine. Featuring classic dark hardwood floors, well-equipped rooms each have dedicated dining and living areas. A microwave oven, minibar and fridge are provided. Bathrooms come with toiletries and a hairdryer. Hotel Crystal Lemon is 5 miles from Leifeng Pagoda. Wulin Square is 8 miles away. The hotel has a business center. Baggage storage is available at the front desk. Guests can enjoy room service for dining convenience. Fresh House Inn provides brightly coloured rooms in purple and green, complete with a personal computer and modern glass en suite bathroom. Located in Hangzhou, it is within a 5-minute walk from The Hangzhou Library and scenic West Lake. Equipped with free wired internet, air-conditioned rooms also come with an electric kettle and telephone. Slippers,hot water showers and toiletries are included in the private bathrooms. Fresh House Inn is 2.4 km from Hangzhou Railway Station and 30 km from Hangzhou Xiaoshan Airport. Free parking is available. For a quick bite, there are drinks and snacks vending machines available on-site. Guests can also get daily newspapers or make use of the luggage storage service at the 24-hour front desk.